After reading an article in the Tamizh magazine ‘Aval Vikatan’ about this remote, road less traveled temple, I couldn’t resist myself from venturing to this place. So took off to this place on a Sunday that too on Vinayakar/Ganesh Chaturthi that’s Lord Ganesha’s B’day, taking a bus from Karur. I have seen this railway station several times in my several train journeys. It’s the biggest station next to Kulithalai when on a journey from Karur. But I seriously wonder why the bus journey takes this much time. By train Pettavaithalai to Karur is only 45 mins, then why does bus journey take 1.5 hrs..???!!!! I still wonder… But since it was not a local train and was only an intercity passenger, the timings were not suitable for me. So I took the bus. As I crossed Kuliththalai I realized the biggest stupidity that I had done. I had forgotten my camera. There is no point going back to get the camera as the temple would get shut for noon, if I did that. I immediately deleted all the songs from my cellphone and used it as my cam there. My plan was to visit Pettavaithalai and then visit Kadambar Koil in Kuliththalai. Little did I know, He had other plans for me…!!! As usual as I alighted at Pettavaithalai, I enquired a flower seller in the bus-stand to direct me to the Iswaran Koil (Lord Shiva’s temple as it is called in every little to big village or town in Tamizh Nadu. I was told to walk straight, in the path I had come for about half a km and I would find the arch of the temple. A turn to the left and a km walk would lead me to the temple. With the scare given by Aval Vikatan to take an auto, as it’s far from the bus-stand, I enquired if it’s walkable. She said, ‘Kind of…!’ So I started walking. The initial half km was in the National highway NH 67, and as it was in Paramathi, it was a lonely road apart from the occasional screeches of the high speed vehichles. In quarter km was this bridge below which a branch of Cauvery bellowed with all its might, thanks to the Tamizh month if Aadi, the Cauvery was brimming. Then I saw the arch that welcomed me to the Madyarjuneshwarar Koil. I turned and kept walking. It was nice to see the manual railway gates, which is almost a rarity, nowadays. 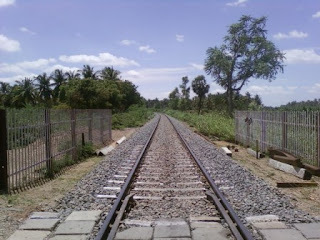 I stood in the mid-track and took admired the long tracks that met at the horizon. I loved it. I kept on walking and the greenery came to life. It was an absolute visual treat. The green pastures and meadow was so pleasing. Also, I observed this occasional damaged ancient rock sculptures on the roadsides. I kept walking and at one fine place was the lane parted into two. I enquired locally which lane was I supposed to take. I was directed in one direction and I kept walking. The road to the temple seemed obvious with the so many people dressed in their best on their way to the temple, to wish Ganesh on his very happy B’day. The greenery on either side was so refreshing and after some time, I realized that the road seemed to end. Again I enquired where the temple was. The lady gave a funny look and showed her arm towards my left and in between the tall coconut trees and thick greenery on my left, the temple’s tall gopuram was playing peek-a-boo. I embarrassingly thanked her and went in. As I reached the north facing temple entrance, I found the temple pretty crowded. I managed to get in and realized it was a nice wedding that was happening inside. And the whole crowd was in the Maha Mandapam of the temple. So I went past the crowd and reached the Ardha Mandapam where the priest was there. He showed me a good darshan of Madhyarjuneshwarar and Balambikai. I enquired him about the lore and legends of the temple and he did too. This temple was built by the Chozhan (Chola) King Kulothunga Chozhan (Cholan) about 800 years ago. Kulothunga Chozhan had built 64 Shiva temples to get rid of his Brahmagaththi (Brahmahathi) dosham. This was one among those. A relief sculpture of Brahmagaththi is seen in one of the pillars in the Ardha Mandapam. Finally, at Thiruvidaimarudhur, he was set free from this Dosham where he was told to exit through the Ambal’s (Lord Shiva’s consort) Sanctum Sanctoram while the Brahmagaththi waited for him at the Shiva’s Ardha Mandapam. 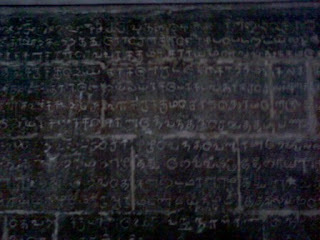 In another pillar is the relief of Pottralam Poovai Siththar, who was an ancient medic who found several medicines esp. for women’s health issues. Till date, it is believed that a sincere prayer to him would cure women’s health issues like menstrual problems, menopause problems, and pregnancy related issues. 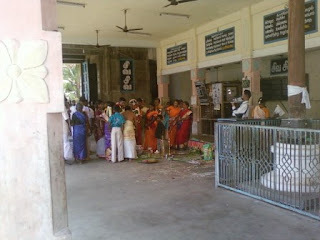 Even when I went there were 2 women sitting in front of the pillar and sincerely praying. There were 2 huge panels of ancient epitaphs in Ardha Mandapam recently discovered 2 yrs ago by the archeologists from nearby town, Bhavani. Hymns were sung on this temple by Saiva Nalvar. The placement of their sculptures was so perfect in front of a low window in the ardha mandapam. It looked like a halo behind them. I came out and started to take the circumambulation. On the eastern wall were the reliefs of Uchchishta Ganapathy, Sri Subrahmaniar and a little sculpture of Nardhana Ganapathy. I loved his posture. He was very much twisted and turned. I loved him that way. On the southern wall was this separate sanctum sanctorum for Vinayakar. On the south facing side was the shrine of Dakshinamurthy and Durga and also sculptures of Brahma, Lingodhbhavar. Dakshinamurthy’s tree was awesome. The leaves were so intricately done. On the wall were the shrines of Gajalakshmi and Valli Deivanai Samedha Murugan. On the western side were the shrines of Chandigesar, Navagraha and also a well brimming with water. 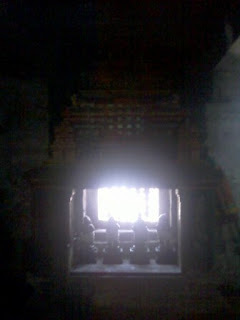 In the Maha Mandapam were the sculptures of Bhairavar, Suryan and Chandran. I guess I have this kid luck wherever I go. 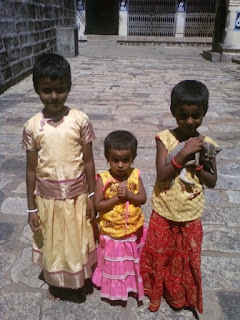 Last time at Namakkal Anjaneyar Temple, I got a cute pic of kids and this time too. Of those several relatives of that wedding that was happening, kids were restless as usual and roaming by. And one of the child, with a sweet little kitten. I know, Anya would be too happy to see this. I did manage to get a peek-a-boo of the wedding too. I said a hearty thanks to the priest and came out. As soon as I came out, I saw this shrine of Varadaraja Perumal at the entrance. I went in again and enquired about it. He said that it was found in the nearby fields and the entrance of this temple seemed to be the best place to keep the sculpture with all its respect. I enquired him about the nearby temples and he said, Thirupparaiththurai, which was 8 miles from here and I was told to take town bus no.97. Well, that stung the wanderer in me and I dropped the plans of Kuliththalai and decided to find this new place. Just across the road, opp. 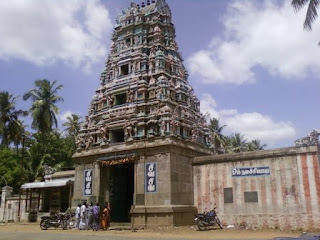 to the temple, leads to the Nangalaaram Vaaikkal. 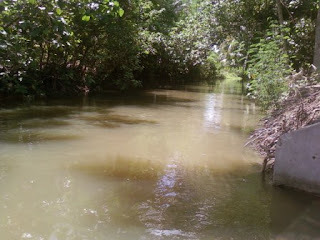 It’s the branch of Uyyakkondan River which I had seen on my walk on the highway flowing under the bridge. Uyyakkondan River is a branch of River Cauvery. The Nangalaaram Vaaikkal was just 3 feet deep. But still I didn’t venture into it. If at all I was accompanied by my village brought up friends who generally have excellent life skills, I would have jumped into it. 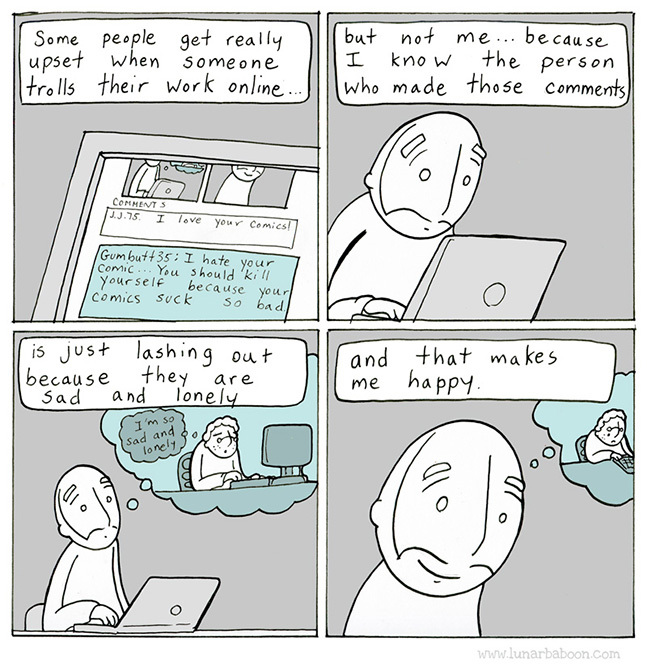 Being alone, errrr…. Ahem. Well, I didn’t explore that part. 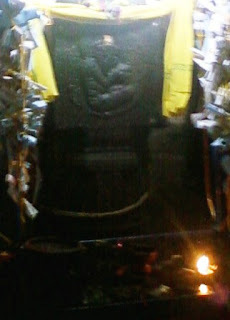 I walked back and had a second look at the Uyyakkondan River and reached the bus-stop and waited for town bus no. 97. Coming soon with Thirupparaiththurai…..
Half a km walk enroute to Karur/Kuliththalai on NH 67. Left turn at the temple arch and 1 km walk from the arch to reach the temple. I'm so glad u liked it..
Sooooo beautiful indeed! Very nice post. Bravo! Another nice post and new information. Very informative post. 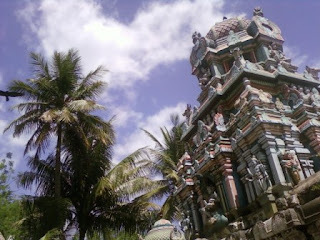 I missed this temple when I had been to Trichy. It looks like lot of sculptures are in this temple. Hi sowmi can u please tell me what poojai it is? It will be a life saviour! lavsvish@gmail.com. Great shots for a mobile Mitr, a good back up. 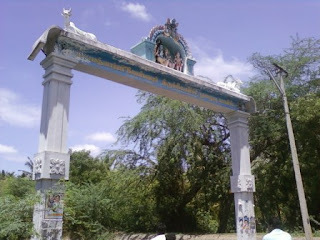 Its a rare temple which many people in Trichy do not know. Only people in Pettavaithalai are aware of this place. Yes right. He is our ancient gynec medic. Do visit dear. Its a nice place. There is one thing I admire in you. You are a go getter. No one can stop you if you set your mind to do something. Fantastic! Another thing I appreciate in you is that you have an excellent presence of mind. When you forgot to take your camera you did not panic and you used your mobile instead. The photos are really good. There is one more thing I admire you for. Your spirit of adventure. Amazing! Instead of sitting at home, you went to an unknown place on your own and explored to your hearts content. In the process, you have produced this wonderful post for us to read and enjoy. Kudos to you. Interesting tour of the temple and very cute kids, too. Hi Mitr! Beautiful photos, thanks for taking me along to a part of the world I don't think I'll ever see in person!! Thanks dear... It's my pleasure that I could show you my part of the world. And Rain please do visit Incredible India at least once in lifetime. Its a beautiful country. Hi, have you ever thought of writing a book? it might help travellers. Welcome to my blog. Thanks for dropping by n commenting. Do drop in often.. Thank you so much for the appreciation. I haven't thought of it but may be would do in future.. The temples' architecture is awesome! I like the way you presented. nice travel blog. U r an elaborate touring person...! 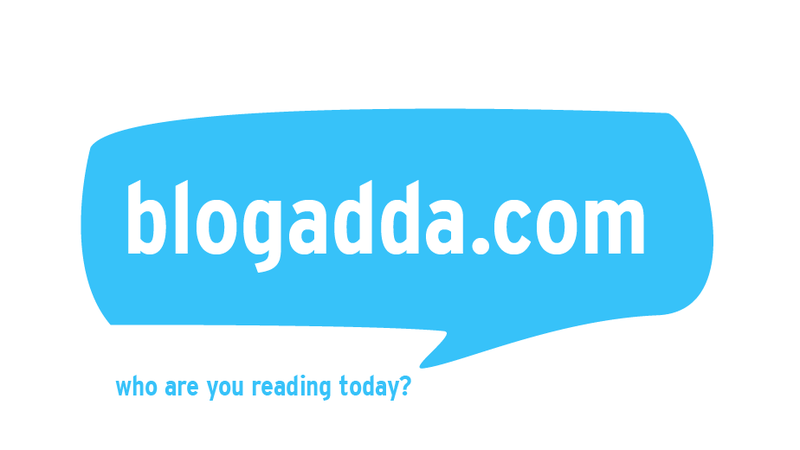 Ur blogs are very useful to me and many others...!! Wonderful descriptions about places..Hat Off to u! Nice post.I am staying in Pettavaithalai.My mail Id is muthucassannova@gmail.com.I really like this post. Sri Mathiyarjunaeswarar Temple, Pettavaithalai, Trichy. 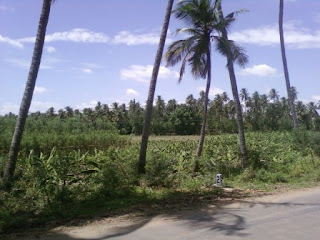 Tamilnadu.